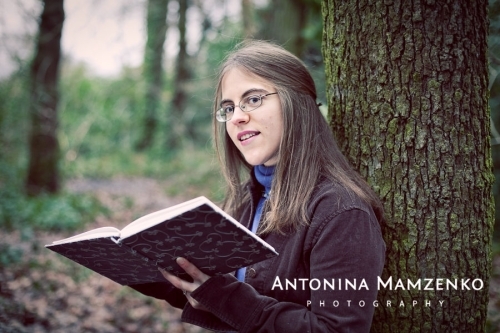 Eternal thanks to the wonderful and talented Antonina for this photo of me! One of my big dreams is to become a successful writer. I’ve one project right now. I’m planning to make a non-fiction book. But, I’m still confused about how to make an outline. Could you tell me how to make an outline? What is the different between an outline for a fiction book and a non-fiction book? Whatever sort of writing you do — blog posts, short stories, essays, articles, novels, non-fiction books — you’re going to need to outline. That outline could be anything from a few words for your own use to multiple pages in a proposal to a publisher. In general, the longer your project, the longer your outline. Here’s an example of a blog post outline, from my journal/notebook (basically my electronic brain ;-)). I wrote that outline straight into my notebook, just as it appears here. I knew I wanted a list post (I had the title in mind first) and I decided that it’d be interesting to have one-word subheaders for the list items; this isn’t something I normally do, but I wanted to echo the “simple” of the title. For anything longer than a blog post, though, you won’t generally start writing your outline straight off: you’ll need to do some other work first. A non-fiction outline will normally be more detailed and more definite than a fiction outline (because you’re more likely to stick to it, and you’re also more likely to be selling a book to customers or a publisher on the basis of its outline or chapter list). If you’re writing a non-fiction book or ebook, an essay for school/university, or even a fairly in-depth blog post, then you’ll want a full and complete outline. That means knowing the start and end of your writing project, and planning out all the major steps in between. For an essay, those major steps might become key paragraphs (or for an article, your subheadings). For a book, you’ll probably have chapter headings plus subheadings for those chapters. The wrong way to do this is to sit down, write “Introduction” at the top, then try to hit each stage in turn. Unless you’ve already got a good grasp on your topic and idea, this is just going to get you stuck. Instead, make a mindmap (or you can use another non-linear method, like writing each chapter heading onto index cards, if you want). Put your topic or title in the centre of a sheet of paper. Write down key points as they come to mind, joining them to the centre. Link sub-points to a larger one; draw lines between related points. You can use different colours, symbols, whatever works for you. This isn’t just a way to sort your existing ideas — it’ll also help you come up with new ones. As you start to get things onto paper, you’ll find more and more thoughts bubbling up. Once you’ve got a mindmap, you can outline. I’ll often put numbers on my mindmap to indicate the order that I want to put chapters (or key points) in. Sometimes, I’ll just use the mindmap as my outline, if I’m writing a blog post. Your outline doesn’t have to go into lots of detail, but it should include all the main chapters or points for your project: don’t leave big gaps in the middle in the hopes you’ll figure it out later. You might want to start at the highest level and gradually add in more information. If you’re working on the book yourself, that’s probably enough; if you’re working with a publisher, they should be able to show you a sample chapter outline so you know how much detail to give. Fiction is a little different. While it’s still a good idea to outline, you probably won’t want to plan out every step right at the start. In non-fiction, your work is generally functional. It’s usually pretty clear what topics do and don’t belong in your book or article. For instance, if you’re writing a blog post on “How to grow great carrots,” you’ll know that a section on tomatoes isn’t going to fit in there. In fiction, you’ve got a whole lot more scope. Anything could happen. You may know how your story or novel should start … but you won’t necessarily know what happens next. Every time I’ve tried to write a start-to-end chapter plan for a novel, I’ve gone off the rails after about five chapters. Now, your mileage may well vary here, but my suggestion is that you don’t plan a major piece of fiction from start to end. You’ve not got much space to play with during a short story, which means that knowing how your characters get from A to B is important; that’s why having descriptions of the scenes helps. As you write, you’ll find that new ideas come to you — and some of the ones that you’ve planned no longer fit. It’s often work outlining on a micro-scale with a novel, perhaps by writing a quick plan for each scene as you reach it. Fiction-writing is, generally, a much more intuitive process than writing non-fiction. I tend to be pretty uptight about plans in most areas of my life, but when it comes to fiction, I’ve learnt to trust much more in instinct and inspiration (and I’m prepared to do a lot more redrafting for fiction than for non-fiction). So … your turn to create an outline! Today, find five minutes to start planning a writing project that’s on your mind. Jot down some thoughts, draw a mindmap, or play around with some index cards … and you should find that your ideas begin to come together. I’m always very happy to answer writing-related questions here on Aliventures. If you’ve got a question, or an idea for a post topic, feel free to email me at any point (ali@aliventures.com) or alternatively, you can use the form on my Contact page. I was writing what I want to be a novel, I still really love it (it’s my first project, you know the one with all the problems). Anyway I learned the hard way to back everything up when I lost over 100 pages from an external hard drive. Luckily my mother in law had been helping me edit and she had all but those last 100 or so pages. Anyways to get back on track when I went back to my outline (to help with the rewriting) I had deviated so far from it that it barely helped. Characters had been killed off that were still critical to the story according to the outline. I had even decided to not include entire countries that were originally in the outlines. Now I have an actual map of an entire world where most of the stories I write take place. Sorry getting off topic again. Outlines, I have found help me everywhere, but help the least when writing fiction. You tend to update the ouline as much as the actual story. Glad you could recover most of the novel, Bridges … it’s awful when computer catastrophes happen! Like you, I found that my novel went waaay off the plan, and I ended up doing a lot of replanning and reorganising after the first draft. I think an outline is still useful (even if you don’t follow it, it gets you moving) but I agree with you that outlines are really most suited to non-fiction projects. Hi Ali, This is perfect. I am working on several projects now and this helps me to refine them. Great post. I can really associate with the process of writing the introduction and slowly grinding to a stop half way down the page. It’s really hard to get the flow again afterwards. Recently I’ve been starting to build up the outline in my mind before I begin writing and will use the tips you have here. A really great resource. Cheers, Rob! In the past, I often used to launch into a blog post without much thought about where I was going or where I’d end up … and it was all too easy to run out of steam part-way. Now, I’ll nearly always write the outline down, but sometimes I’ll just have it in my head: the key thing is spending a few minutes thinking it through before starting writing. A timely post. My agent is patiently awaiting a proposal from me for a non-fiction book, and I keep tweaking the outline, adding details here, taking them out there. Part of it could be delaying sending it, perhaps a fear of it being rejected. But I think it’s also, reading this, because I don’t have a formal mind map. I do have three distinct threads I’m trying to make sure are woven through the outline, but I haven’t formally mapped them out yet. Something to consider. Patrick Ross’s last blog post ..What’s Your Take on Pinterest? Best of luck with the proposal, Patrick! I often find that when I’m putting something off (even with all sorts of “productive” tweaking) that it means I need to take a step back and look for an area which I’ve not quite finished thinking or working through. Thanks, Ali! My goal is to complete it by the end of the week; after this week my schedule’s going to get crazy. I did do some mind-mapping on it, though, and I feel it’s helping. The paragraph about how to outline a blog post was helpful. Do you make your first draft on paper or do you go straight into the texteditor? Thanks, Andreas. I draft straight onto a computer. With blog posts, I write in Word and then copy-and-paste the text into WordPress (using the “Paste from Word” button). Amazing how simple and effective it is to outline a writing project. I need to do it more – but too often become impatient to get my ideas down and, before I know it, get lost in the content. This post is a great reminder to create the overall structure first! Mike Bundrant’s last blog post ..Mental Illness App – What’s MyM3: Another BB gun strikes a tank. I struggle with my blog posts, so your tips on not only blogging but how to tackle other forms of storytelling were timely. Thanks Ali and all the best at your conference. Outline is like a blueprint for building a great content. This is a great article. Thanks a lot, Ali. I’ve got a bad habit of writing my blog posts without writing an outline. But when I do outline, I usually just list my subheadings and use those as a guide to write each paragraph. I will try the mind map technique for my next blog post or article. Thanks for this article. It’s very useful information. Ummmm….I ‘ve never even thought about outlining before writing my blog posts…and I’ve written close to 400 of them! I may have to try that. Thank you for the specific tips on writing a non fiction book outline. I’ve been doing it as you suggest but was feeling like it wasn’t “right.” A little additional confidence is a wonderful thing! Thanks Jill! Not all bloggers outline their posts, of course, but I definitely find that an outline (even a very brief one) makes for easier writing. Great post Ali with some really helpful practical advice. I am a fan of Mindmapping my articles and have even written an article on Mindmapping here…but excuse my lame cartoons! Great Post. I am going to be teaching a class on Exploring the Craft of Writing. I will make sure each student has your information.